Planning a wedding in Las Vegas is as simple as picking a location. Once that has been settled, your Las Vegas wedding will unfold with amazing ease. You will avoid months of stressful planning, often accompanied by angst and tears, which seem to be an integral part of the wedding preparations in your home country. Your first consideration about a wedding in Las Vegas is whether to marry in a free standing chapel or in a chapel connected with a hotel or casino. Both types of venues are well equipped to ensure your wedding in Las Vegas will be a happy, memorable occasion. Click here to view the top five free standing Las Vegas Wedding Chapels. So what are the advantages of marrying in a hotel chapel? *	Hair and makeup can be done in the hotel’s beauty salons. * You can dress in your room and head for the chapel without getting caught in on of Sin City’s notorious traffic jams. You won’t be late for your wedding in Las Vegas. *	Most hotels have a variety of fine restaurants and banquet rooms. You can host your wedding party without driving anywhere. *	After the party, you can unwind in the wedding suite right on the premises. If budget is not a consideration, undeniably the most lavish venue for your wedding in Las Vegas is Wynn’s. Depending on the package you choose, you could be met at the airport by limousine, taken to the court house for your marriage license, relax with a massage in the spa, find a fine bottle of champagne in your room on your wedding night, and be pampered with breakfast in bed the following morning. And of course, there will be bouquets, rose petals blanketing the aisle, photography, a private room for dressing before the wedding while your guests relax in the privacy of the Wedding Salon. Ceremonies here range from the $19,350 Elegant to the Forever at $790. No matter what ceremony you choose for your wedding in Las Vegas, each of Wynn’s elegant wedding salons has a private foyer where guests can mingle before the ceremony and a private Bridal Room for last minute primping. Seating ranges from 65 to 120 guests, depending on the salon. Las Vegas is a fantasy world. Have you considered immersing yourself in the magic for your wedding in Las Vegas? At the Excalibur, a fairy tale castle makes it possible. As well as providing you with all the services you will need to stage a wedding in Las Vegas, this hotel invites you to celebrate your enchanted romance by stepping back in time for a medieval wedding. As King and Queen, you will don flowing brocade robes trimmed with ‘ermine’. Renaissance costumes, available for rent during the ceremony for $75 each, reproduce fashions of the era in a variety of color combinations for the complete wedding party. A ceremony you will cherish for the rest of your life will take place in one of the Excalibur’s exquisite Canterbury Wedding Chapels. 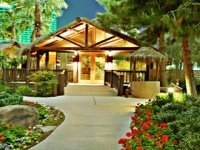 This hotel offers a variety of packages for your wedding in Las Vegas ranging from the Heart of the Castle ceremony at $395 to Legendary Love at $1,575. The Trop, as it is affectionately called, once stood alone on the corner of the Strip and Tropicana Avenue. Over the years, it has been surrounded by elaborate, glittering neighbors, namely the MGM Grand, New York New York and the Excalibur. It may not be the chicest spot in town, but behind the hotel, set in a verdant five-acre oasis is a free standing chapel. There is not a more scenic spot on the Strip for a wedding in Las Vegas. The Trop’s gardens incorporate a pool, waterfalls, bubbling streams and ponds teeming with colorful Koi. Pink flamingoes and other exotic jungle birds strut their stuff, oblivious to on-lookers. You will exchange vows in the Island Wedding Chapel, which looks like a romantic bamboo hut transported from an island in the sun. The chapel accommodates 80 guests. For smaller gatherings, you can choose from various outdoor beauty spots. A wedding in Las Vegas at the Tropicana will range from $399 to $1099. The web site occasionally offers special rates for special events – example: a $99 Valentine’s Day special included champagne and strawberries. In today’s fast-moving, modern world, numerous couples include their children in their wedding day. Nothing would make your wedding in Las Vegas more enjoyable or memorable to them than having it all happen at Circus Circus. The event will be more enjoyable for you too. Youngsters get over tired and over stressed at times when you really need them to be co-operative. At Circus Circus, there are free circus acts from 11 am until midnight and free clown shows The little darlings will think they have gone to heaven and will be as good as angels for your wedding in Las Vegas. Wedding ceremonies are performed in the Chapel of the Fountain with packages ranging from the $280 Traditional to the $975 Circus Spectacular. A standard wedding with chapel, minister and music ranges from $145 weekdays to $175 on weekends. Haven’t yet made up your mind about a wedding in Las Vegas? It might help to review some of the celebrities who took the leap and tied the knot in Las Vegas. Hey, if it was good enough for ol’ blue eyes Sinatra, what’s holding you back? Some of the famous from yesteryear up to the present who chose to exchange rings in Las Vegas include: Elvis and Priscilla, Angelina Jolie & Billy Bob Thornton, Richard Gere & Cindy Crawford, David Cassidy & Kay Lenz, Zsa Zsa Gabor & George Sanders, Greg Alman, Shirley Bassey, Ray Conniff, Deanna Durbin, Red Foxx, Judy Garland, Bob Geldoff, Robert Goulet, Betty Grable & Harry James, Johnny Hallyday, John James, Buck Owens, Mickey Rooney, David Sanborn, Telly Savalas, Heather Thomas, Mel Torme, Dinah Washington, Erin Brockovich, Bette Midler, James Caan, David Cassidy, Cindy Crawford, Dudley Moore, Dennis Rodman, Rita Hayworth, Patty Duke, Mary Tyler Moore, Dean Martin, Steve Lawrence & Edie Gorme, Ricki Lake, Wayne Newton, Joan Crawford, Paul Newman & Joanne Woodward, Nancy Sinatra & Tommy Sands, Judy Garland, Joan Collins, Michael Jordan, Mel Torme, Dixie Chicks Natalie Maines, Sally Jesse Raphael, Bruce Willis & Demi Moore, Frank Sinatra & Mia Farrow, Britney Spears and more. When you decide that a wedding in Las Vegas appeals to you, we suggest you do your research to ensure that your day isn’t ruined by something you overlooked. Click here and under the heading Research guarantees happiness, there is a list of things you will want to consider. Once you have decided that a wedding in Las Vegas is indeed what you want, you should familiarize yourself with the legal requirements of getting married in Vegas. Everything you need to know is explained in our Guide for your Wedding in las vegas.